Q. Which audio interface format is best for low latency? I am about to set up a new rig for my friends. We're going to use Guitar Rig 3 and IK Amplitube Fender a lot, so we need an interface with very low latency. What hardware format do you suggest? SOS contributor Martin Walker replies: Whether you have a Mac or PC, the best choice of interface depends on various factors. In general, the more tightly integrated the audio interface with the computer, the more likely you are to be able to run it at a lower latency, since there are fewer possibilities for interruption. If you're running a desktop computer, there may therefore be advantages to choosing a PCI or PCI Express (PCIe) soundcard, which may also give you tighter timing on its MIDI ports. If your computer has both types of slots available, PCIe is the more future‑proof option. If you want to take advantage of this closer integration with a laptop, nowadays your choice is limited to a few PCIe cards, since the older Cardbus slots are rarely found on recent models. For many people, USB and Firewire audio interfaces are far more convenient alternatives, since you can quickly swap them between any desktop and laptop machine, but when your goal is really low latency be aware that some USB and Firewire models include small extra buffers to help smooth playback performance, which increases overall latency slightly. This may or may not be declared to your sequencer, which is why in my interface reviews I check the 'real world' latency to see if it's higher than expected. You may also have to be careful about the make and model of controller chip found behind the Firewire ports on your computer, since some are not compatible with certain audio interfaces, and if you run into such problems you'll probably have to increase your buffer size (and hence latency) to avoid audio clicks and pops. Texas Instruments (TI) is the make most widely recommended by audio interface manufacturers, but you should consult the interface manufacturer's web site for specific chip‑set recommendations to avoid problems. If your computer has Firewire 800 ports, you have double the bandwidth compared with Firewire 400, but few musicians will actually need the extra unless they require more than about 56 simultaneous channels of 24‑bit/192kHz audio. USB interfaces have traditionally been considered poor relations to their Firewire brethren, largely because earlier interfaces designed for USB 1.1 ports struggled for bandwidth when attempting stereo in/out at a 96kHz sample rate. 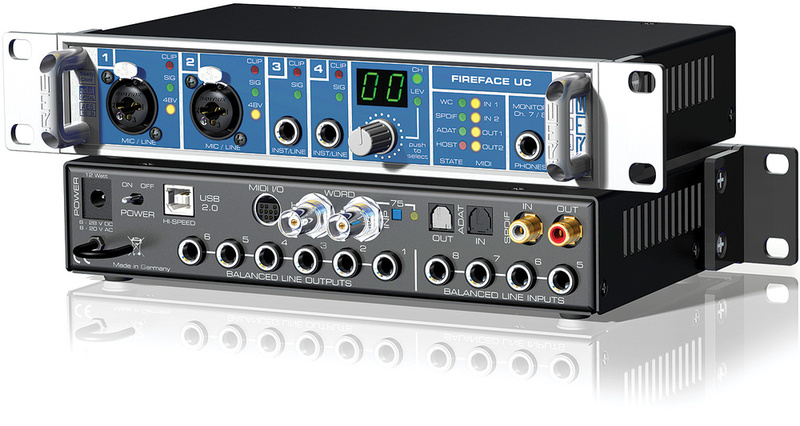 However, today's Hi‑Speed USB interfaces can manage more simultaneous inputs and outputs than Firewire 400 devices, and have recently gained a new champion in RME, whose Fireface UC claims "revolutionary ultra‑low latencies”. 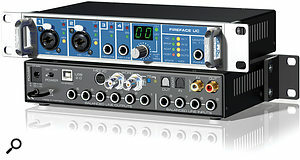 USB 2.0 audio interfaces have lagged in popularity behind Firewire models, but this could change with the introduction of RME's new Fireface UC and its "revolutionary ultra‑low latencies”. However, there are two other key factors to running any audio interface at lower latency settings: driver quality, and how well your computer has been set up for audio purposes. The first of these is largely out of your hands, and while some manufacturers have gained a particularly good reputation for low‑latency performance, the lowest latency you can manage may vary between models from a particular manufacturer, and sometimes even between driver revisions. More critical to achieving low latency in many cases is your computer. Well‑chosen hardware components and implementing recommended operating system 'tweaks' for audio (such as those published in SOS) can often result in you being able to use smaller audio buffer sizes, since these minimise the chances of any non‑audio component or task interrupting the smooth flow of audio. Overall, over the last few years I've been able to run most review audio interfaces across all hardware formats at buffer sizes down to about 64 samples (1.5ms latency at 44.1kHz), but this is largely because my PC is properly set up for audio purposes.